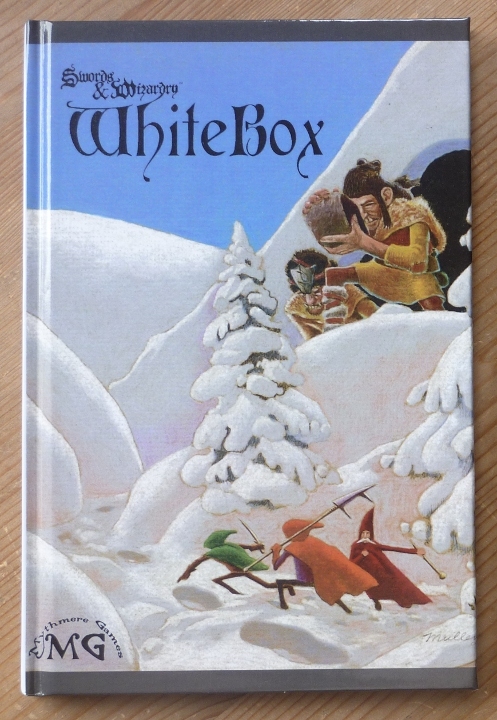 I think I like the WhiteBox art best as well. It bothers me that it doesn't fit well on the hardback cover: there are grey bars at the top and the bottom... I think it has something to do with the format of a previous print. The grey bars look awful, but yeah that Mullen piece is great. The aspect must have been off a bit when he scaled it from its original size, if you recall it was on the cover of the first printing of WB, which was letter-sized softcover. It's no secret WB is my favorite of the three. It's more accessible than the 1974 version of OD&D, but I think its open nature requires a more experienced ref than the other two S&W versions. For a new group with an inexperienced ref, I would point them to core. OK, OK, fair enough. I can see how that could cause confusion. We have drifted a bit off-topic. So, can anyone think of any other specific features of S&W that they prefer to the Original Game? How about Core - Advanced - Complete? What I like about S&W is how every edition has a different way of handling combat and in addition an alternative is presented. In the orginal Little Brown Booklets there is hardly any description of how combat works exactly (the alternative combat rules, that is. Chainmail is refered to for the true original combat rules). In S&W WhiteBox there's the OD&D LBB Alternative Combat Rules plus a more fine-grained version of that. In S&W Core there's quite a different interpretation to the OD&D rules and an alternative emulating the Holmes way of handling combat. In S&W Complete there's a more complicated version of the Core combat rules, the Core combat rules themself, the Core take on the Holmes combat rules, plus an alternative which focuses on the segmented combat round. That's the original rules plus 5 alternatives, varying in complexity: great! Excellent point. And the multiplicity of methods reinforces the general S&W philosophy: There's no "right" rule. Use your judgement. Tweak things. Pick the option you and your players like best, or invent a new one of your own! ClawCarver wrote: Excellent point. And the multiplicity of methods reinforces the general S&W philosophy: There's no "right" rule. Use your judgement. Tweak things. Pick the option you and your players like best, or invent a new one of your own! I like the single saving throw. I like the fact that both Ascending and Descending Armor Classes are baked into the system, literally a requirement in the license terms. I love the single saving throw, although, as I am learning the rules I have considered using that as a base and letting my players add a relevant ability score modifier to create just a little bit of diversity. <-- My house rule musing right there is another thing I love, as you can take the game and make it your own, and no one ruling is the right way. I'm loving it so far and I am still waiting on the Frogs to ship my six rulebooks for my group! I did get in my Rappan Athuk stuff from Noble Knight today, though!